Tom Wright’s The Meal Jesus Gave Us describes its topic as “the central Christian action”, regretting bitterly that the practice which should both symbolise and constitute unity amongst Christians is in fact a matter of division and contention (37). The book, previously published as Holy Communion for Amateurs, offers an introduction for those who are unfamiliar with the ritual or – perhaps more likely – have not particularly considered its origins and purposes. It is written in a straight-forward style and assumes almost no knowledge of theology or Christian history, though Wright seems to be writing with Anglo-American Protestants in mind, given the assumptions about his readership implied by his points of discussion. The first part of the book, entitled “How it all began”, is made up of short fictional scenes, in which the reader is invited to imagine themselves at a series of “parties”: the birthday party of a young relative in the modern day interrupted by a Martian, a celebration of Passover in Turkey around 200 BC, the Last Supper, a dinner with a Gentile Christian in the first century. Through these scenes Wright draws out his themes, such as the meaning of celebrations, the way humans organise time, the bringing together of past and present in ritual, the transformation of lives which can take place through symbolic actions. The themes are interwoven effectively, and produce some strong if implicit arguments about the value, impact and tradition of the Eucharist. Personally I found these chapters rather difficult to read, just because of their style. Second-person narratives are always very tricky, and outside experimental fiction it’s difficult to get away with a story conducted via sentences like “Then everything goes quiet in the street. You go over to one of the houses and knock on the door” and “’But…but…not you, surely?’ you ask.” Unfortunately it reminded me less of contemporary fiction and more of text-based RPGs from the 90s, and at some points I was waiting to be asked whether I would drink the wine, look for a secret passage behind the tapestry, or try to repair my crossbow. When the voice shifted to the early Christian explaining his conversion and why his community met for a meal it didn’t get much easier. There’s a particular tone that appears in some Christian apologetics, a sort of bluff, hearty, “I’m-just-an-everyday-fellow-but-it-seems-to-me” style which I find hard to be convinced by. To pick a selection: “What’s with these Jews? I’m not sure I know, but if this story is typical of their stuff they’ve certainly got something”, “And for the whole world, too. Yes, that really blows me away”, “it’s as though Jesus himself is somehow now living in us. Scary, huh? You’d better believe it”, “yes, even funny Philemon with his stuck-up ways, and that runaway slave of his, Philemon, who came back after meeting this Jewish jailbird” (20, 29, 31, 27). I can absolutely see the value of a straightforward style and a conversational tone, but I don’t think I’ve ever had a conversation like this. (Partly because if someone ever has started talking in this way, I’ve looked for a way to get out of the saloon bar.) Wright is clearly setting up a character, but it’s a character I think I’ve only ever met in early twentieth-century novels. This is not to discount the early chapters: Wright’s style demonstrably does work for hundreds of thousands of people, but I can’t honestly say I was able to enjoy it. The second section is called “The Thank-You Party” and considers the meaning of the “Jesus-meal” (Wright’s studiedly neutral term) today, and the various controversies which surround it. It covers the varieties of names for the practice, the changes in understanding which developed from the Reformation, the question of Christ’s presence and how we might want to change our attitudes to it in the future. The conceptual scheme Wright sketches in is based on time: the bringing together of past and present in ritual whilst the future – “God’s time” – continually collides with the action. Thus he explains the issue of presence by reframing Calvin’s notion of being “drawn up” to heaven in the Eucharist in terms of time: that God is rushing through time to meet our moment (65). For Wright, the dramatic moments of transformation and understanding in this story take place at the Last Supper, in the Early Church and during at the Reformation. (It is telling that another brief table scene occurs during the explanatory section of the book, between Luther and Zwingli in Marburg, which links them thematically if not explicitly to the meals in the first section.) The conclusions he draws in the last chapters stress both the importance of the ritual and the need for reverence in carrying out (whatever the situation or conditions). A lot of complex ground is covered effectively, though I found the authorial voice got in the way sometimes, and wondered whether phrases like “I know this is getting complicated. If you can find a better way of putting it, good luck to you” could have been swapped for some more quotations from earlier writers or more direct explanation. As I mentioned, Wright’s work is evidently very effective for many people, but it never quite settled long down long enough for me to listen to it carefully. 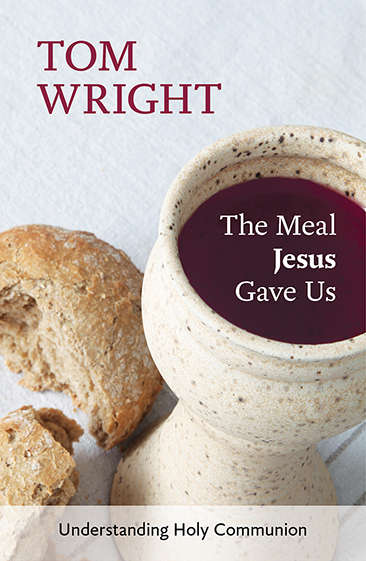 The Meal Jesus Gave Us, by Tom Wright (SPCK: 2014, £7.99) I am grateful to SPCK for providing a review copy. Im interested in giving this one a shot. I typically really like Wright’s stuff and I have always appreciated and been able to see the immense value of Communion. Thanks for the review.